The world is getting smaller, fewer and fewer places remain untouched, unknown, undisturbed. This is true in about every aspect of life. Extreme sports as well, as people who love to do crazy stuff always look for the next place to jump, ski, surf or whatever. 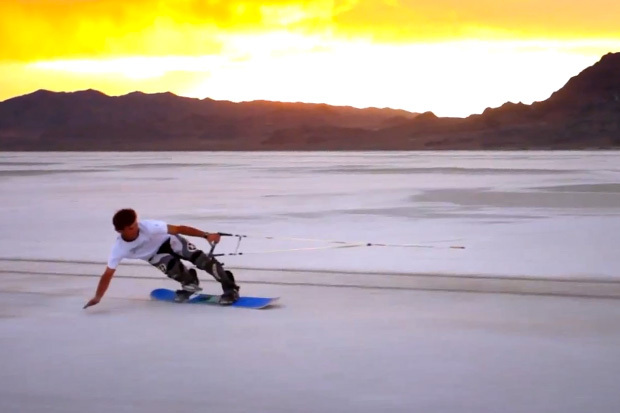 Welcome to the Salt flats of Utah, and Salt Boarding. Just tie the board to the ATV, make sure you have a good grip and plenty of padding, because hitting salt while going 50 mph isn’t very pleasant. I must say that because of the epic-ness of the place and your surroundings this sport or branch of boarding or surfing salt boarding looks like one of the more unique stuff to do on a hot August day in Utah.